Dorothy Ellen, Stevens, 83, of Midland, died peacefully on Wednesday, October 31, 2018 at the Toni and Trish House. She was born March 4, 1935 in Harrison, the daughter of the late Ernest and Helen (Mitchell) Boulton. Dorothy graduated from Flint Technical High School. She worked as a secretary at Siebert Elementary School for 27 years. On January 12, 1982, she married Don Stevens who preceded her in death. 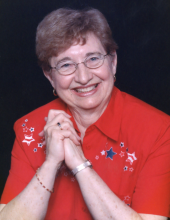 Dorothy enjoyed travel, aquasize, line dancing, reading, and crossword puzzles. She is survived by her children Randy Angus, Dave (Tamara) Angus, Scott Angus, and Eric Stevens; five grandchildren, and her siblings Richard (Jean) Boulton, James (Joanne) Boulton, Judy (Matt) Eakes, Joyce (Larry) Metzger, and Charles (Sherri) Boulton. In addition to her parents and husband, Dorothy was preceded in death by her daughter Carla (Mike) Balcirak, daughter-in-law Deb Angus, and son Aaron Stevens. A private memorial service was held on November 8, 2018 with the request that memorials in her name be made to the Toni and Trish House. Cremation Arrangements have been entrusted to the care of the Ware-Smith-Woolever Funeral Directors. To plant a tree in memory of Dorothy Ellen Stevens, please visit our Tribute Store. "Email Address" would like to share the life celebration of Dorothy Ellen Stevens. Click on the "link" to go to share a favorite memory or leave a condolence message for the family.